HandKrafted by Stephanie: MTME Sneak Peek Day 2 - Shop Around! MTME Sneak Peek Day 2 - Shop Around! Hello! Today is the second day of sneak peeks for the My Time Made Easy © September release. This month, Lauren is release one mega template, Shop Around © and Shop Around Accessories ©. 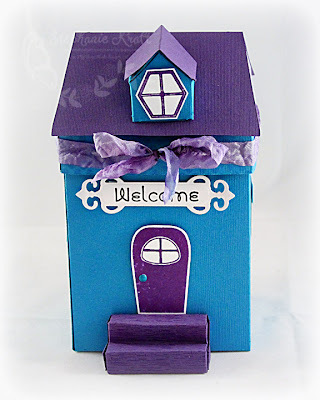 It is a house/store shaped template with many fun accessories. There are also 4 new stamp sets that coordinate with the template. Be sure to visit Lauren and Silke to see their creations! Dawn will have a lovely card to show you, and so will Tammy Hershberger.. a big welcome to Tammy as she joins our team this month! When I first saw the template, I thought of a school house! I used Sabrina's school colors of teal and purple. For the teal, I used Bazzill Artesian Pool and my purple is Couture Quest cardstock. For my first house, I kept things fairly simple. I added a couple of the Shop Around Accessories © -- the stairs and the pop-up window. On the stairs, I stamped a woodgrain pattern (from Home Improvement ©) onto it before I assembled it. 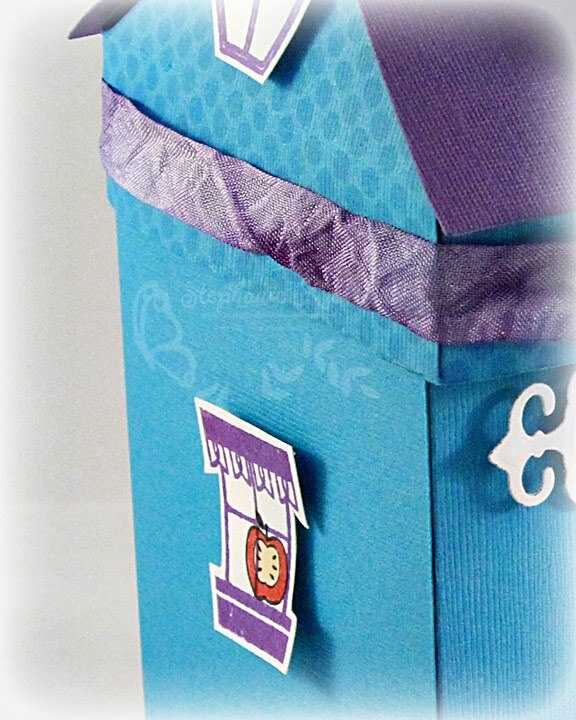 The door, windows and polka dots on the roof (see side view below) are also from the same stamp set. 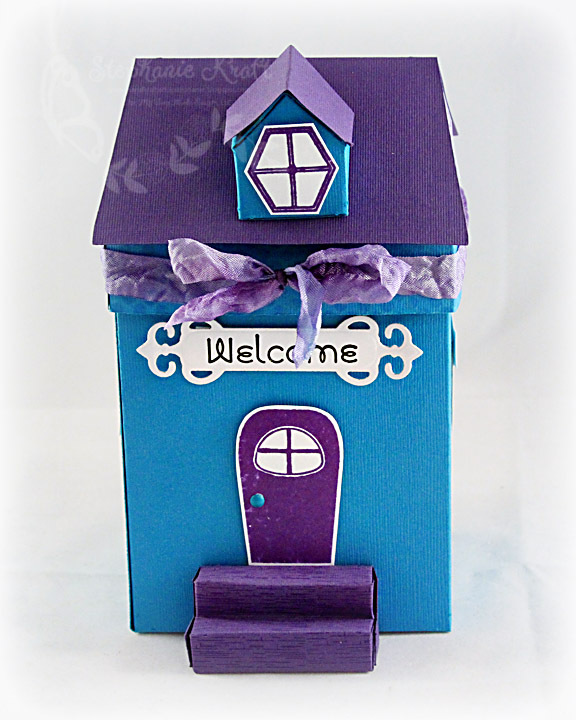 "Welcome" is from another stamp set, Sign It ©. I will be showing you more from these sets and the other sets in future projects. Below is a little detail shot of the side. I added a little apple in the window (apple is from Well Preserved ©. The roof is actually the lid to this school house and the base is quite large.. you can fill this some yummy treats. I filled mine with See's suckers! 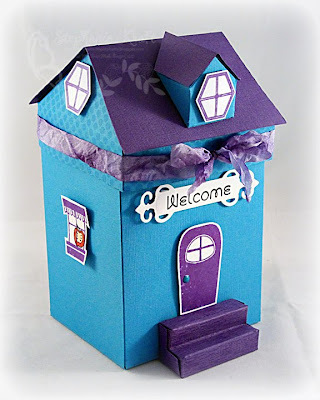 Accessories: Shop Around ©, Shop Around Accessories © template (MTME); Fancy Tags Shapeabilities (Spellbinders), Markers (Copic), Brad, Ribbon, Glimmer Mist (Tattered Angels), Foam tape. Adorable Steph - love the unique colored school house! You must give me lessons on the stairs :-) Great job. I love the little apple in teh window! Sweet idea !! Cool looking school house! Love it! And the apple for the teacher in the window is so cute! Love it! I like the apple in the window! This is just darling! I love the bright colors! 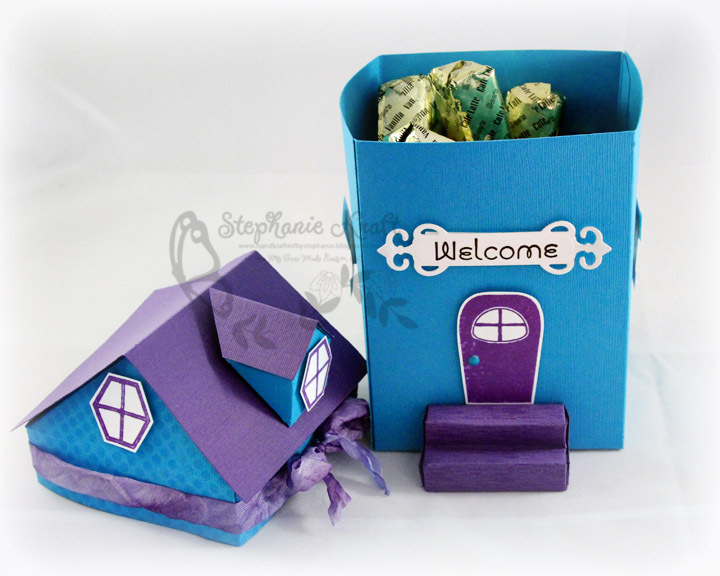 Cute house Stephanie! What a fun color combo! What a CUTE idea to do a schoolhouse, Stephanie! LOVE the colors on this, and the apple in the window is perfect! I'll bet kids would like a purple school. Another fun house! This template is fantastic! Love what you did with it!